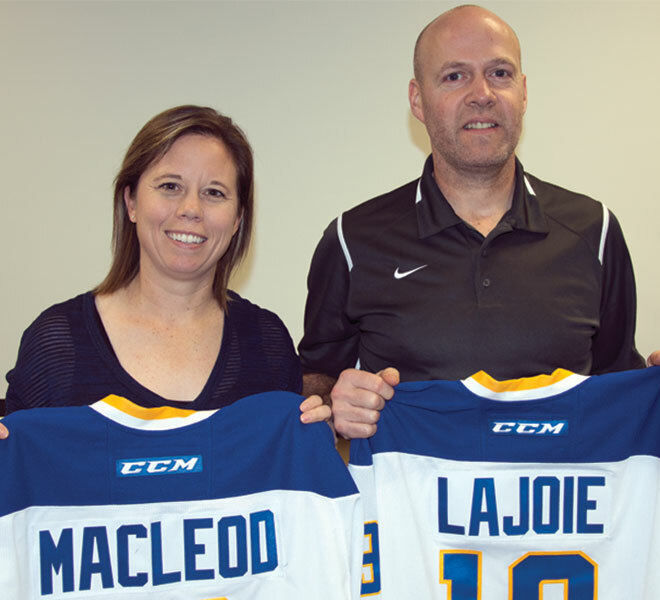 RED DEER – While members of the Greig family are no strangers to hockey accolades, brother and sister Ridly and Dara can now say they’ve made Hockey Alberta history. The apple apparently doesn’t fall far from the tree, as Ridly and Dara’s father, Mark, is a former professional hockey player. Drafted 15th overall by the Hartford Whalers in the 1990 NHL Entry Draft, the former WHL standout is a veteran of over 1000 games as a pro, including 125 in the NHL. With Dara already going through the Team Alberta process in 2016, Ridly was able to lean on his older sister and draw from her experience during his journey to the WHL Cup. Prior to Ridly and Dara both being named to their respective Team Alberta rosters, the Greigs experienced another memorable hockey moment when Ridly won the 2017 Alberta Cup with Team South, exactly 30 years after Mark won the 1987 Alberta Cup with Calgary North. “It’s great that years and years later, after I had such a wonderful experience, that this Hockey Alberta program is still going strong, and providing these experiences for the kids,” said Mark. Ridly and Team Alberta narrowly missed out on a gold medal at the WHL Cup in October, losing 3-2 to Team BC in overtime. Meanwhile, Dara will be playing in the fifth-place game on Saturday at 11:00 a.m. at the U18 Nationals in Quebec, after Team Alberta finished round-robin play with a 1-2 record. RED DEER – Just in time to help with everyone’s hockey-related Christmas shopping, Hockey Alberta is pleased to announce the opening of the Hockey Alberta Shoppe. The Hockey Alberta Shoppe is the official, online store for purchasing Hockey Alberta branded apparel. The Shoppe features a wide array of garments – with styles for males, females, and youths – in several colours, adorned with the Hockey Alberta logo. Each item can be personalized with an individual’s name, team or club name, and/or number. The Shoppe includes clothing for males, females and youth, as well as hats, and bags from different manufacturers. The Shoppe can be accessed directly from the Hockey Alberta website, hockeyalberta.ca, or by going to hockeyalberta.entripyshops.com. Shipping is free on all orders over $50. To help ensure your order arrives before Christmas, be sure to place your order by December 3. RED DEER - Hockey Alberta is pleased to announce the coaching staffs for the 2018 Alberta Winter Games. The eight coaching staffs for the male program are comprised of one director of operations, one coach mentor, one head coach, and two assistant coaches. The six coaching staffs for the female program are comprised of one director of operations, one coach mentor, one head coach and one assistant coach. Male Regional Selection Camps for the Alberta Winter Games kick off today (Thursday) and Friday across the province, while the female selection camps are set for December 8-10. The Alberta Winter Games are set for February 16-19 in Fort McMurray. RED DEER - Only nine officiating clinics remain for the 2017-18 hockey season in Alberta. If you are interested in taking part in one of the remaining clinics, please contact the appropriate clinic coordinator. RED DEER - Seventeen Albertans, including five Team Alberta alumni, are among the 60 players named to Team Canada West’s camp roster ahead of the 2017 World Junior A Challenge. Markus Bougaslavsky (Calgary), Levi Glasman (Red Deer), Dylan Holloway (Bragg Creek), Jacob Kendall (Camrose), Kyler Kupka (Camrose), Jamie Rome (Calgary), Isaac Saniga (Spruce Grove), Parker Saretsky (Wainwright), Jordan Taupert (Medicine Hat), Blake Wells (Blackie), and Austin Wong (Cochrane) are among the 36 forwards invited to Canada West’s camp. On defence, Alberta will be represented at the camp by Jacob Bernard-Docker (Canmore), Sean Comrie (Edmonton), Jarrod Gourley (Calgary), TJ Lloyd (Lloydminster) and Jonny Tychonick (Calgary/Penticton). Hunter Virostek (Turner Valley) is one of six goaltenders vying for a spot on Team Canada West. Bonnyville Pontiacs’ Head Coach and General Manager, Rick Swan (Edmonton), will serve as an Assistant Coach for Team Canada West, after serving as Canada West’s Video Coach in 2016. The Canada west hopefuls will assemble in Calgary December 2-5 for four days of practices and games as part of the Team Canada West selection camp at the Markin MacPhail Centre at Winsport. The players were selected from the Canadian Junior Hockey League’s five western Junior A leagues: the British Columbia Hockey League (BCHL), Alberta Junior Hockey League (AJHL), Saskatchewan Junior Hockey League (SJHL), Manitoba Junior Hockey League (MJHL), and Superior International Junior Hockey League (SIJHL). RED DEER - Your vote could send one creative young Albertan on the trip of a lifetime! 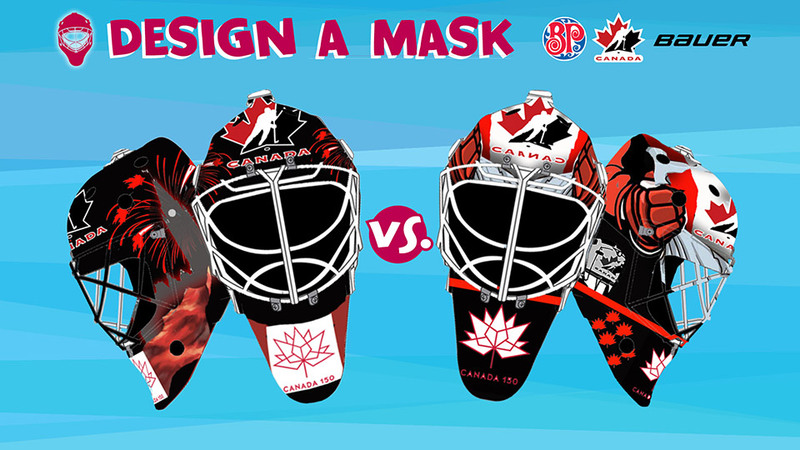 Hockey Canada has once again partnered with Boston Pizza and Bauer to give young Canadians the opportunity to get into the game on a global level and show their creativity through the Design-A-Mask program. The submission period has now ended. Four designs remain — two in the under-13 category and two in the 13-18 category — but only two can win. Jaxon B. of Calgary and Brody P. of Edmonton were named the two finalists in the under-13 category. Both of their submissions can be seen below. Your votes will determine which masks will be worn by Canada’s National Junior Team goaltenders at the 2018 IIHF World Junior Championship, December 26, to January 5 in Buffalo, New York. Winners will also receive a trip for two to a game at the 2019 IIHF World Junior Championship — in Vancouver/Victoria, British Columbia — along with a $50 Boston Pizza gift card, a Team Canada jersey, and his/her own replica painted mask. Voting is open until Sunday, November 19 at 11:59 p.m. ET. One vote per person permitted. RED DEER - Hockey Alberta’s Coach of the Month for October is Chad Goeree of Sherwood Park. Chad is the Head Coach for the SPS Fuzion Peewee team, and the Assistant Coach for the SPS Fuzion Bantam team. "My coaching philosophy is simply, first and foremost, making sure the athletes are having fun, learning team work, respecting others, and understanding the importance of hard work," said Chad. "I try to teach players that the only limitations they face in both hockey and life are the limitations they put on themselves, and that through hard work and dedication, they can accomplish anything." "Coaching isn’t just about what happens on the ice, it matters what happens off the ice too. Kids need to come away from games and practices feeling good about themselves and Chad inevitably makes this happen," said the parent who nominted Chad. "Not only does Chad help grow the players, he helps grow his bench staff, including himself. Personal growth as leaders is encouraged and supported within the team. When we have coaches in the system that have become great leaders, it is important that they are recognized. It is my belief that Chad personifies this type of leader and should be recognized as such!" The Speaker Series features a game-day seminar session, with each session offering a unique professional development opportunity to learn from high profile junior coaches - as well as a chance to catch the Grande Prairie Storm in action. The night will feature presentations from Grande Prairie Storm Head Coach Matt Keillor, and Spruce Grove Saints Head Coach Bram Stephen, who coached together on Team Alberta’s gold medal-winning U16 team in 2016. QUEBEC CITY - For the second straight year, Team Alberta claimed fifth place at the National Women’s U18 Championship, wrapping up the tournament with a 4-1 win over Quebec. Danielle Serdachny opened the scoring for Alberta just under seven minutes into the first, and Kassy Betinol doubled the lead with her second goal of the tournament midway through the second period. Chloe Puddifant and Mackenzie Butz added two more for Alberta to begin the third, before Quebec broke the shutout bid with just seven minutes to go for a 4-1 final. In her second start of the tournament, goaltender Camryn Dever made 24 saves for the win, and was named Alberta’s Player of the Game. Both Drever and Erin Fargey finished the tournament with a 1-1 record in net. For more stats and information on the U18 Nationals, click here. Rocky Mountain Raiders forward Chloe Puddifant leads all skaters in points (12) through the first month of play, while Lloydminster forward Kelsey Hall (five goalies) and Calgary forward Mackenzie Loupelle (five assists) lead the league in their respective categories. QUEBEC CITY - Team Alberta closed out round-robin play at the U18 Nationals with a 3-0 win over Team Atlantic on Friday morning. After being shut-out by both Ontario teams in the first two games, forward Kassy Betinol snapped Alberta’s goalless streak just 33 seconds into the second period. Team Alberta built on it’s lead early in the third with goals from Breanne Trotter and Courtney Kollman to seal its first win of the tournament. In her second start, goaltender Erin Fargey shut the door on Team Atlantic, stopping all 25 shots sent her way to earn the shutout win, and earned Player of the Game honours for her efforts. Team Alberta and Team Atlantic both sit with a 1-2 record following round-robin play. Alberta now awaits the results of the game between Ontario Red (1-1) and Ontario Blue (1-1) to find out when its game will be on Saturday. QUEBEC CITY - Team Alberta fell to 0-2 at the 2017 National Women’s U18 Championship following a 2-0 loss to Ontario Red on Thursday afternoon. Ontario Red opened the scoring with less than four minutes left in the first period, and doubled its lead with a late second period goal. Team Alberta out-shot Ontario 27-25, but goaltender Madelyn McArthur shut the door on Alberta, stopping all 27 shots sent her way. Alberta’s Erin Fargey made 23 saves in the loss. Forward Courtney Kollman was named Team Alberta’s Player of the Game. QUEBEC CITY - Team Alberta opened its 2017 National Women’s U18 Championship with a 4-0 loss to Team Ontario Blue on Wednesday. Ontario Blue opened the scoring 9:16 into the game, and would add two more in the first period to take a 3-0 lead. After a scoreless second frame, Ontario added one more in the third to make it a 4-0 final. Team Alberta was just narrowly out-shot by Ontario, 28-26. Camryn Drever stopped 24 of 28 shots, while her counterpart, Erica Fryer, stopped all 26 shots to earn the shutout win. Forward Rachel Weiss was named Team Alberta’s Player of the Game in the loss. Peewee teams - Enter the Chevrolet Good Deeds Cup! RED DEER - The Chevrolet Good Deeds Cup is back for another season, and will be awarded to the Peewee team who has the best season off the ice. The Good Deeds Cup is open to Peewee teams across Canada who give back to their community. To compete for the Chevrolet Good Deeds Cup, your team will need to make a commitment to off-the-ice improvement by performing at least one good deed in your community. The more impressive the deed, the better your team’s chances of winning will be. Good deeds can be entered at chevrolethockey.com with a one-minute YouTube video of your team’s deed. The top ten finalists will be selected, and will be voted on by Canadians. The winner of the Chevrolet Good Deeds Cup will be chosen from the top three vote-getters. Prizes will also be awarded to the finalists and semi-finalists. The deadline to enter the Chevrolet Good Deeds Cup is December 31. November 01, 2017 Peewee teams - Enter the Chevrolet Good Deeds Cup!